Many new commands are here to make your design work easier: Design rules check, User data access options, automatic insertion of links, optimizing wiring order sequence depending on the placement of material in the cabinet, etc. This version is also compatible with all versions of Microsoft Office 32 and 64 bits. Other major changes include the « electrical content portal » (See further on) with specific way to access manufacturer parts databases. From this version onwards, the software will include the elecworks Viewer (See further on) to watch the projects taking shape. Mixed drawings management: In these new mixed drawing types, you can use the wiring line diagram commands and those of the schematic diagrams. Voltage drop calculation on cable: specific data have been added to the cable properties to allow you to automatically calculate the voltage drop for a cable. These calculated results are shown as reports. Publish to eDrawings: A new command lets you select the drawings to be exported to eDrawings to help with easy exchange of project data. Design rule checks: These rules are in the form of reports, accessible by this icon : «Design rules check », can be used to verify particular details and easily detect any design errors, for example : missing manufacturer part for a symbol, unconnected wires, child-symbols without a parent-symbol, etc. 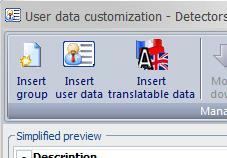 A new interface to manage user data: two new icons « Insert user data » and « insert translatable data » are available in the menu, to intuitively access the user and translatable data. A new command “Automatic insertion of links” when run, links up all the lines having the same equipotential on all the drawings where they appear. Optimization of wiring order helps you redefine the wiring sequence according to the physical placement of the device in the 2D layout, so that the lengths of wires are reduced and so help you with the cabling. 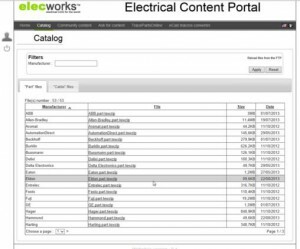 From elecworks 2014 onwards, the manufacturer catalogs and cable catalogs are not installed by default. You are now free to choose which catalogs are to be added/updated, giving you these two advantages: faster installation of the software and rapid search of parts during use. Two new icons help you choose to have manufacturer catalogs as «Local content» (to let you continue to install/ update the catalogs already like you do today in your elecworks archives) or «Internet connection » (to directly access « electrical content portal » with a list of available catalogs and to download only the selected catalogs). You can use the search filter to quickly find a manufacturer. 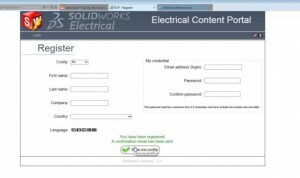 SolidWorks Electrical users also have access to their version of this portal. 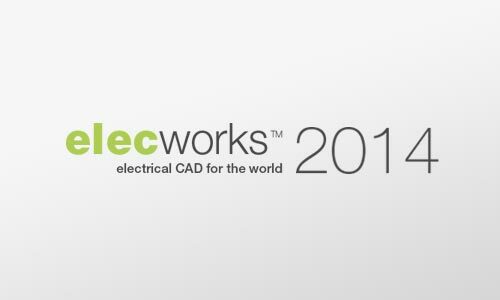 From version elecworks 2014 onwards, a new product, elecworks Viewer, has been developed. You can now study the designed projects on an existing database. 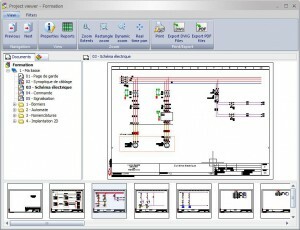 The users have access to elecworks project navigation in a small window to look at different schematic drawings and then they can zoom in on a selected drawing. Elecworks Viewer can be installed as an additional client, or another stand-alone machine where elecworks has been installed, but the license is no longer available because the license was transferred earlier.